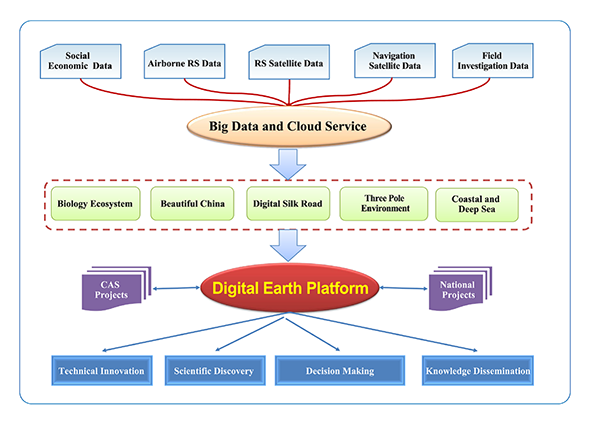 On 12 February 2018, the Chinese Academy of Sciences (CAS) announced the launch of its 'Big Earth Data Science Engineering' (CASEarth) project in Beijing. 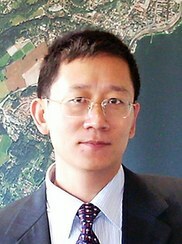 With a total funding of approximately RMB 1.76 billion (USD 279 million), and greater than 1,200 scientists from 130 institutions around the world involved, this five-year project (2018–2022) is headed by Huadong Guo, an academician of the CAS Institute of Remote Sensing and Digital Earth. 1. Building the world’s leading Big Earth Data infrastructure to overcome the bottlenecks of data access and sharing. 2. Developing a world-class Big Earth Data platform to drive the discipline. 3. Constructing a decision-support system to serve high-level government authorities and solve multiple issues. This joint centre will provide a very large volume of data, comprehensively enhancing national technological innovation, scientific discovery, macro-decision making, and public knowledge dissemination, as well as other significant outputs. To achieve its goals, CASEarth consists of the eight Work Packages (research components) to help it achieve technological advances and obtain innovative results, paying special attention to data sharing and encouraging interested scholars to rely on the platform to carry out research. For example, CASEarth Small Satellites will provide continuous observing data from space according to the missions of the project; the Big Data and Cloud Service Platform will build a cloud-based Big Data information infrastructure, and processing engines with 50 PB storage and 2 Pflops data-intensive computing resources; and the Digital Earth Science Platform will integrate multidisciplinary data and information into a visualization facility to meet the requirements of decision-making and application in areas such as Biodiversity and Ecological Security, Three-Dimensional Information Ocean, and Spatiotemporal Three-Pole Environment. In particular, it will provide a comprehensive display and dynamic simulation for sustainable development processes and ecological conditions along the Silk Belt and Road, and provide accurate evaluation and decision support for Beautiful China’s sustainable development. In summary, CASEarth is expected to increase open data and data sharing; realize comprehensive assimilation of data, models, and services in the fields of resources, the environment, biology, and ecology; and build platforms with global influence. CASEarth will explore a new paradigm of scientific discovery involving Big Data-driven multidisciplinary integration and worldwide collaboration, and will constitute a major breakthrough in Earth Systems Science, Life Sciences, and related disciplines.